The month of April contains the central remembrance of the year for the Christian. 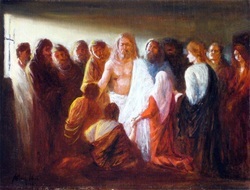 As we look intently on the death and resurrection of Jesus, we will focus our attention on the appearances of Jesus to some of his friends, including his appearance to Mary in the Garden, the disciples (particularly Thomas), the disciples on the Road to Emmaus, and Jesus' appearance anf resotration of Peter on the laske shore. As we do, our hope is that you may have a true encounter with Jesus Christ that alters the course of your life, much in the same way as it did for the disciples. "Jesus Appears to His Friends"
"The Doors We Hide Behind"